Insurance isn't intended to be a money-making scheme. It's intended to limit losses, in the event of a negative situation. Everyone pays for homeowners' insurance, but it's usually with the hope you don't need it. Livestock Risk Protection (LRP) plays the same role, but for cattle prices. 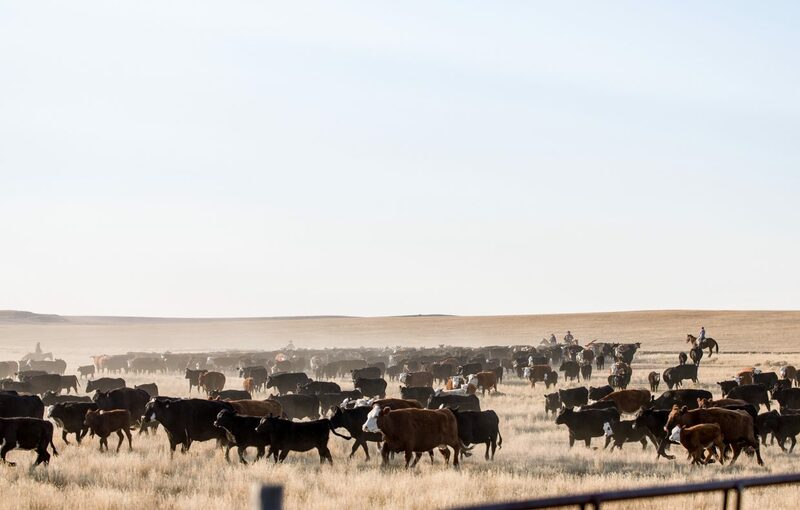 Cattle producers have the option to buy, with a 13 percent government subsidy, an "insurance policy" on the cattle price with the LRP program, available through many ag insurance agencies. They can lock in the price a minimum of 13 weeks prior to their estimated sale day and pay a premium. That guarantees them 70 to 90 percent of their locked-in price, in the event of market fluctuations. The actual price cattle bring doesn't matter with LRP insurance; it doesn't cover a deficit from an estimated price versus actual price, but the price the CME says cattle are worth on sale day. Producers list a target weight, the percent (70-100 percent) of the expected ending value they want paid for, and an ending period of 13, 17, 21, 26, 30, 34, 39, 43, 47, or 52 weeks in the future. There are variations for steers, heifers, Brahman and dairy cattle. "It is risk protection to lock in a price for the delivery of calves and yearlings for designated sales times," said Melissa Stearns with Three Corners Agency in Hot Springs and Edgemont, South Dakota. No more than 2,000 head may be listed on the policy, but as few as one head can be. Cattle may sell through any venue, but no more than 30 days prior to the time the contract expires. The expected ending value, which is locked in by the producer when it reaches a price they like, is compared to the actual ending value, which may result in indemnity payment. If the expected ending value is above actual ending values based on the CME reported index, producers will be compensated, depending upon their coverage level. 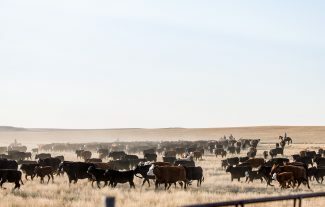 "It doesn't matter what they sell for, it's based on the futures price," said Shannon Sand, a South Dakota State University livestock business management field specialist. "It expires when you say you're going to sell the cows." Sand compares LRP with house or renter's insurance in that it is set in place to protect the value, or a percentage of the value, of the items inside the home. If everything is fine, the premium is paid, and a producer ends the year without a loss. If the year ends in a down-turned market—equating to a fire in the home and a loss of goods—LRP insurance offers protection. "It's a game of controlling expenses. We choose to use it as a risk management program," Stearns said. "Some years we collect, other years we don't. On the years we don't collect, it's probably a good thing; that means the market went up, and we had a good year." Stearns gave the example of steers selling at the end of October that have a target weight of 650 lbs. locked in at $1.69.40. Those steers may actually sell for $1.80, though the CME for the past five days comes in at $1.61. An adjustment will be paid and payout received even though the steers sold for more than the LRP was locked in. In 2016, Stearns and her husband had a LRP contract in place, locking in their steers and heifers with an Oct. 28 maturity date. "At that time, we felt we were comfortable with our contract, but in the middle of July, we lost 70 percent of our grass to a fire from a lightning strike," she said. "We chose to feed our cows and looked at marketing options for calves." They hauled their calves to a sale in Crawford, Nebraska, on Sept. 30. "We specifically picked that day. The market had started to turn, and we knew we were in a loss position. We knew we had to stay within those 30 days, and we were fine when the contracts matured. We had payout on our contract as well." Some bankers ask that producers use LRP to protect their break-even point. By figuring exactly how much they have to get for the cattle to pay all their bills, producers guarantee they can make it another year in case of a market disaster. By choosing to be compensated for less than the full price they lock in (down to 70 percent), they can lower their premium costs. For example, if a producer locks in $1.67 on 50 head of 500-lb steers at the 70 percent rate, and the CME price drops to $1.40 by sale day, LRP will pay $19 per hundredweight ($1.67- $1.40 = $.27 x .7 = $.189), for a total of $4,750 added to the check, even if they went through the sale ring at $1.56. A lot of factors affect the premium, so it's best to talk to an insurance agent about the best options. While LRP is used by only a relatively small percentage of producers, Matt Diersen, an extension economist with SDSU, feels that the program is tailored to the cow-calf producer. "Of the 15,000 cattle producers in South Dakota, less than 1,000 LRP policies were sold last year," he said. "My bias is that it fits the cow-calf producer best. If you're a little bigger, and you're feeding calves to a feeder weight of the 800-lb. area, it's not much different than futures and options on feeder cow contracts." Say a producer has 100, 500-pound steers, that would be exactly 50,000, which would make economical sense for a feeder cattle contract. However, if that producer has only 50, 500-pound steers, he'd have only half of a contract, so that removes the contracting as a viable option. "You're either overpaying for that 'insurance' or under-covered, if you opt for nothing," Diersen said. "With LRP you're still paying by the hundred-weight, but you're paying for only the calves you’ll be selling. While many variables change what a policy can cost, Diersen estimates that a policy can cost about $1 to 5 per hundredweight until sale time, so for a five-weight, approximately $5 to $25 per head. During years with high volatility, the rate can be $6 to $8 per hundredweight. Returns can range from nothing to $25 per hundredweight on an average year, so up to $125 per head on that 500-pound steer. "When I hear a $20 drop in weight on a seven-weight, that's a $140 decline," Diersen said. "That's a lot of money to watch just go away."